Welcome stampin' friends! 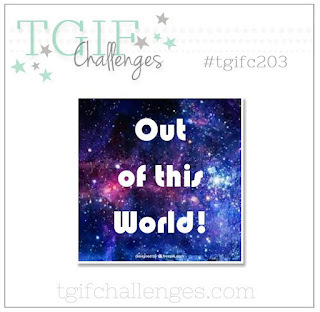 Today over at TGIF Challenges we are featuring cards with an "Out Of This World" theme. 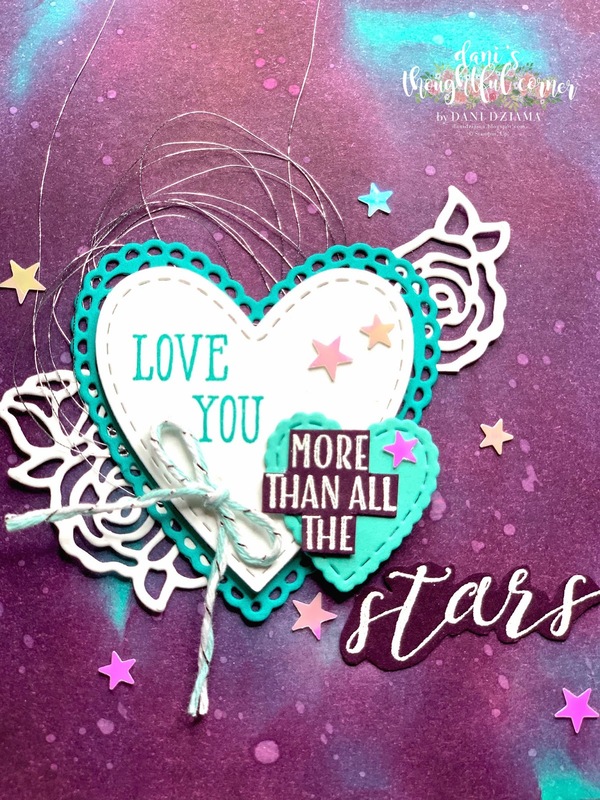 When I first sat down to create a card I immediately reached for the Prussian Blue Brusho Crystals. Then I remembered that I had used them all. Yep- that's right! I used an entire canister of Prussian Blue Brusho Crystals on my OnStage card swaps back in November. Back to the drawing board it was. Then I remembered a technique that my friend Ruthie shared with me a few years ago. I'm not really sure what the technique is called but I'll explain how I created the background. To create this gorgeous background I used 3 colors. Coastal Cabana, Bermuda Bay and Blackberry Bliss. To begin- I used a Sponge Dauber to apply Coastal Cabana ink to the entire front of the 4" x 5-1/4" Whisper White layer. I then used a Sponge Dauber to apply some Bermuda Bay ink however this time I only applied the ink in certain areas of the layer. Finally- using a Sponge Dauber I applied the Blackberry Bliss ink to the layer making sure not to completely cover up the other two colors. After the Blackberry Bliss ink was applied I took an Aqua Painter filled with water and flicked water onto the front to create the splotchy "stars". Looks pretty cool, right? This is a close up of all the pretty things! 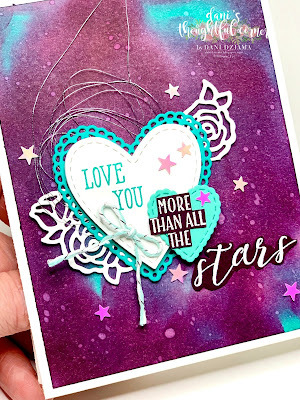 The Be Mine Stitched Framelits are the perfect compliment to the sentiment on this card! The sentiment was created using two different stamp sets. 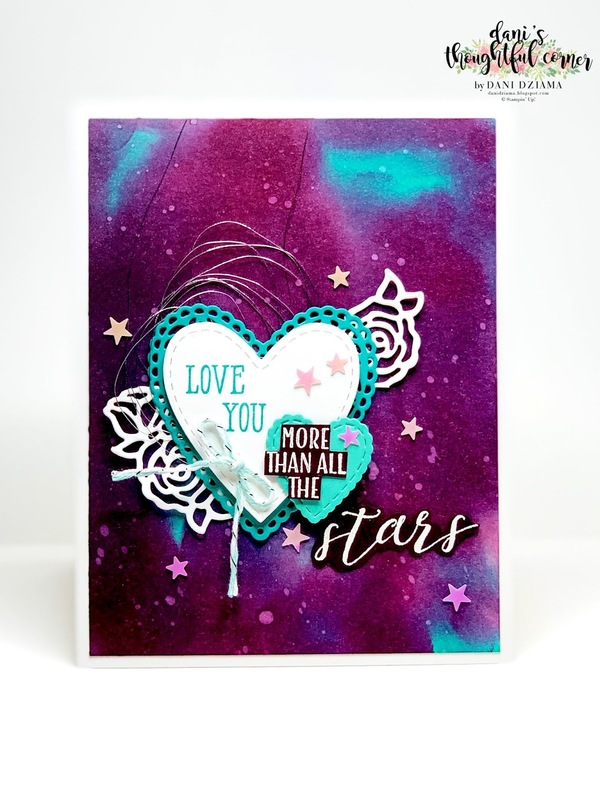 The Love You is from the Well Said Stamp Set and it was stamped in Bermuda Bay ink. 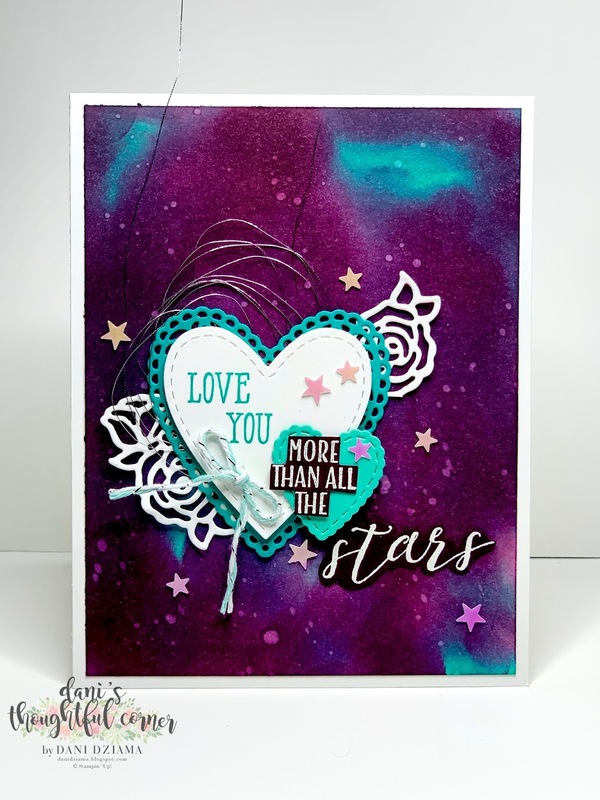 The More Than All The Stars is from the Little Twinkle Stamp Set and was stamped in VersaMark ink onto a piece of Blackberry Bliss Card Stock then heat embossed using the Heat Tool and White Stampin' Emboss Powder. Even though the adorable little Silver/Pool Party Baker's Twine bow is not in one of the 3 colors I used to create the card- it compliments them all well! The Twinkle Adhesive-Backed Sequins make the perfect finishing touch! 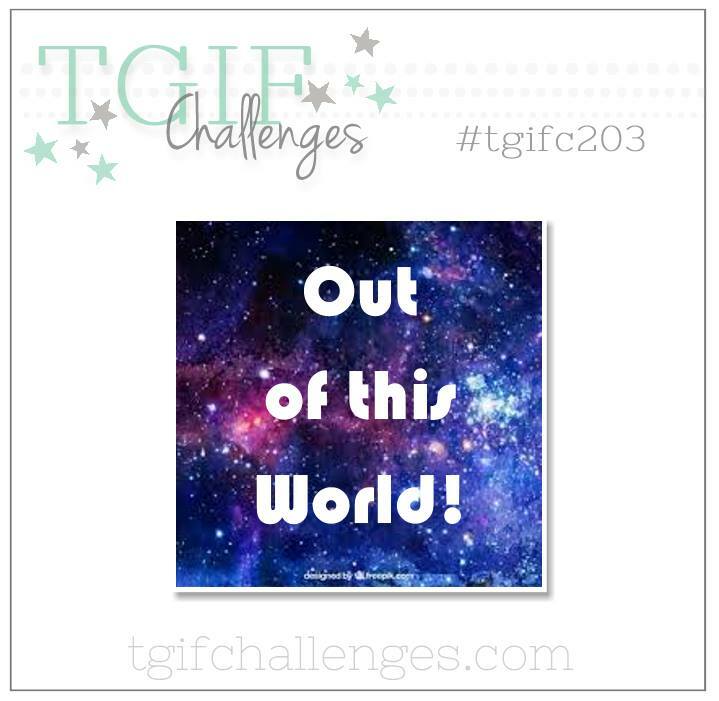 Won't you play along with us this week? I'd love to see what you create! Awesome card! I love how your created your background. I'll have to try your technique. Wow! I'm impressed. would love to see the steps of the inking of the background. Sometimes i'm a visual learner. OSAT Blog Hop: Bring on the Birthdays!